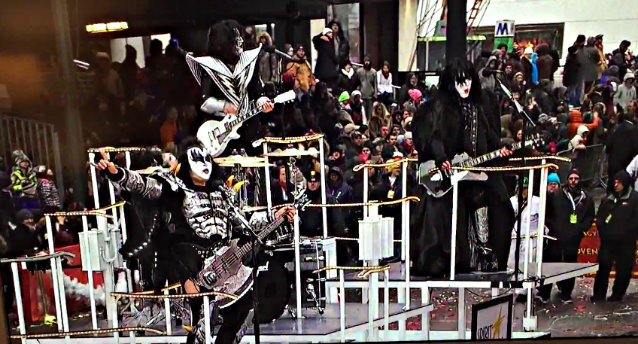 KISS played earlier today (Thursday, November 27) at the 88th annual Macy's Thanksgiving Day Parade. The performance, which aired on NBC, can be seen below. The special appearance by KISS — which was secured by the band's brand management company, Epic Rights — was led by more than 600 cheerleaders from around the country, paying tribute to the band with a rocking KISS medley. The 88th edition of America's favorite holiday tradition began at 9:00 a.m, ready to entertain more than 3.5 million spectators lining the streets of Manhattan and more than 50 million viewers nationwide. "Macy's Thanksgiving Day Parade is the most popular and visually spectacular holiday parade in America, and there is no doubt that KISS, unequalled in the world of concert performance, will deliver stunning theatrics at the Parade," said Juli Boylan-Riddles, EVP of global strategic partnerships and licensing. KISS leaders Gene Simmons and Paul Stanley jointly stated: "2014 has been a banner year for us and participating in one of the country's most beloved events caps off what has truly been a spectacular 40th anniversary." The cast of the NBC's "Today Show" hosted the broadcast, which also featured Sting, Meghan Trainor, Idina Menzel, Nick Jonas, the cast of "Sesame Street" and actress Quevenzhane Wallis, with Philadelphia's Taney Dragons and their star pitcher, 13-year-old Mo'Ne Davis, kicking things off.